Red Hots are small hot cinnamon flavored candies that are sometimes called cinnamon imperials. 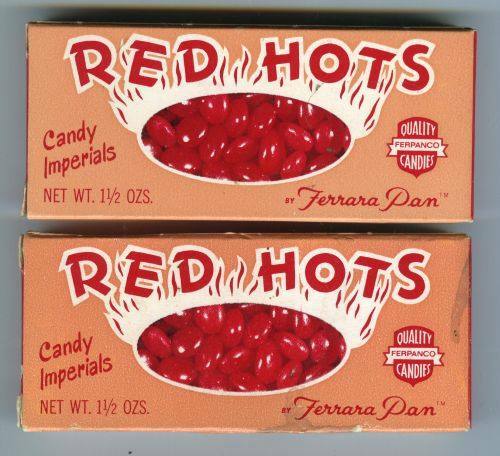 In the early 1930's, the Ferrara Pan Candy Company created the famous Red Hot using the cold panned candy method. The idea of a piece of cinnamon hard candy was developed prior to the production of Ferrara Pan's Red Hots. The name "cinnamon imperials" is a generic name used by the candy industry to indicate a piece of cinnamon hard candy. Red Hots were such a part of my childhood! In the 1950s and early 1960s, my siblings and I would eat Red Hots by the sticky handfuls and laugh at each other's red tongues. We would have contests as to how many we'd jam into our mouths at a time. And if our red mouths and tongues did not give us away to parents and teachers, then our red, sticky palms would!